Will my hand be stiff after undergoing a wrist arthrodesis? When should an arthrodesis of the wrist be reversed? What exactly is a wrist arthrodesis? What other surgical options are there to a wrist arthrodesis? No. This is a very common misconception. A wrist arthrodesis involves the rigidification of the wrist, not the hand. All fingers will retain full mobility and the hand can still be turned. Wrist splint which will temporarily lead to a rigidification of the wrist. As concerned patient you may want to try on a wrist cuff to get an idea on how a wrist arthrodesis would affect the mobility of your wrist (please refer to image). Such wrist cuff will allow you to retain full mobility of all fingers as well as to turn your hand. Arthrodesis of the right wrist. 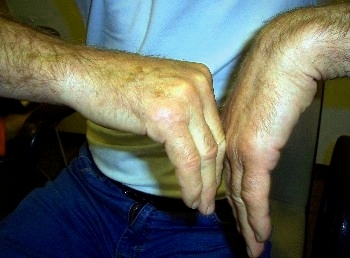 The image shows a right wrist that underwent arthrodesis. As a consequence of the arthrodesis it will no longer be possible for the patient to move the wrist into an extended or flexed position, nor can he perform ulnar or radial motions. A total wrist fusion will result in the inability to perform flexing or extending motions as well as ulnar and radial motions. Only in case of complications may the mobility of the fingers be affected as well. A wrist arthrodesis is a large and non-reversible intervention which therefore requires careful evaluation. In a healthy wrist extending, flexing, ulnar and radial motions may take place without effort. A wrist arthrodesis requires the removal of the articular cartilage as well as the locking in of the radius to the metacarpal bone of the middle finger in order to prevent any motion!